What you are seeing here is not some sort of modern art, but it may make some statement about our society today. This is Skinput, a conceptual technology that can recognize a user’s taps of a finger on the skin, but it seems to be limited to the hand and the rest of the arm. This tech is under development from Carnegie Mellon University and Microsoft, and requires that the user wear a certain armband with “piezoelectric cantilevers, or sensors that measure pressure, acceleration and force”. Click on the video after the jump to see this technology in action, and a most unusual method of controlling Tetris. 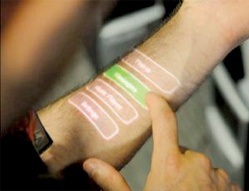 Skinput also uses a pico-projector to create images like menus on the user’s arm. With a tap on the skin above or below the menu, the user has a very unusual form of navigation. You have to admit that this technology could have all sorts of applications for the mobile world. Just picture selecting your tunes on your arm instead of your iPod, or dialing your phone on your palm instead of your mobile device. Still, I can’t help but this tech will lead to an age when we are all comfortable with integrating technology with our flesh. Then our cyborg teachers will say that it all began with Skinput.